Activists in the Black Lives Matter movement, Mission community organizers and newcomers, many of whom were tech workers, met Wednesday night to discuss ways to confront racial inequality that included collecting data, investing in communities and questioning the diversity within the rank-and-file of tech workers. 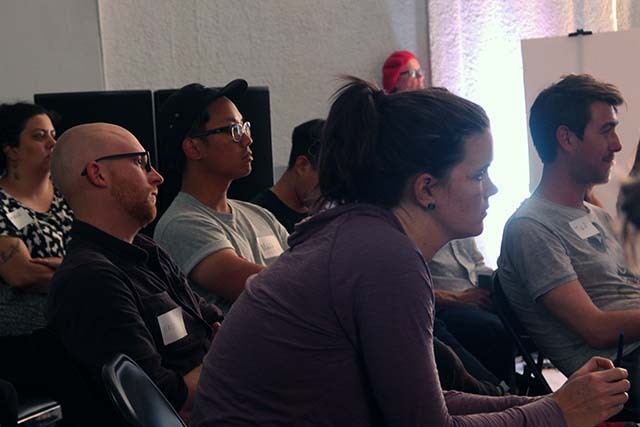 Several of those in attendance with tech backgrounds suggested online or data approaches to inequality, but organizers wanted them to focus instead on investing in the communities in which they live, interpersonal relationships and direct confrontations in their workplaces. “I was thinking about building a directory where you can see how judges have ruled in the past,” said software developer Jason Cater, aiming to tackle what he said is the disproportionate sentencing of black people in the justice system. “Reforms to policing are great, but racism in the justice system cannot be overlooked. There needs to be a concerted place to give you information on how to vote,” said Cater, adding that tech should be viewed as a tool helpful in advancing the movement, rather than harming it. Lindsey Gordon, a former tech worker and entrepreneur, said that she was shocked by the graphic video footage that captured the December 2 shooting of Bayview resident Mario Woods by police officers who said the man was wielding a knife at them, although that narrative has been disputed. After witnessing a “racist incident” first hand over the July 4 weekend, Gordon said she had come to the meeting to find out about planned Black Lives Matter actions and how to get involved. “I’ve educated myself on the issue and feel ready to participate in larger actions,” said Gordon. The meeting was an effort to provide context and resources for those concerned with a series of incidents in which police officers shot and killed black men that have made national headlines in recent weeks. 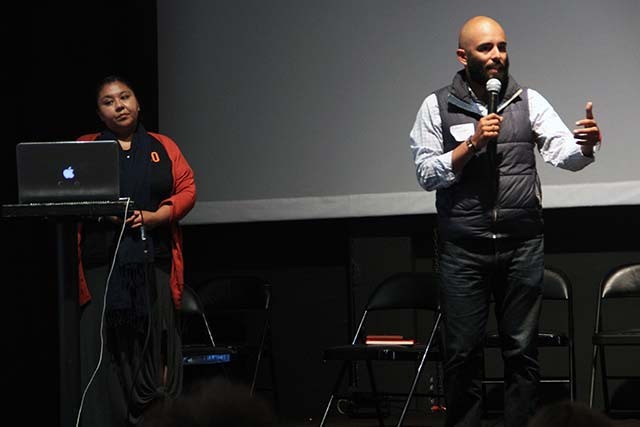 But community activists who addressed the some 200 people that filled the venue’s auditorium immediately made clear that “showing up” for racial justice “goes beyond protests, meetings, and Facebook posts” declaring commitment to the struggle of protecting – and improving – the lives of Black and disadvantaged communities. The activists leading the discussion stressed that protesting and claiming support for the movement by “coming to the streets” is just one avenue to address racism, and that a continual effort is required by the white community to permanently improve the conditions of people of color. The work, said Gomez, comes in the form of supporting local businesses and schools, and by investing back into the communities that have been uprooted by the city’s affordability crisis. Understanding and supporting the immediate needs of vulnerable communities, said Gomez, is the crux of this type of community organizing. Gomez urged attendees – many of whom identified as newcomers to the city – to examine their own roles in furthering the economic gaps that she said has contributed to racial bias and unrest in many of the city’s rapidly gentrifying neighborhoods. 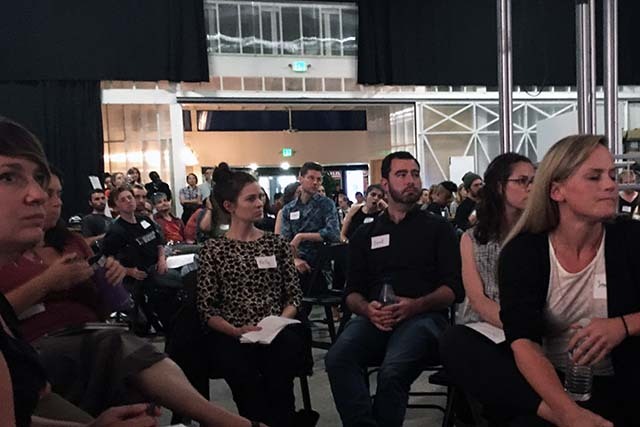 Many of those who attended were grappling with that very question, and said they wanted to be part of the solution. During a question and answer session with the activists, one attendee wanted to know what he could do once the meeting concluded. Attendee Charmaine Shuford recently moved to San Francisco from the East Coast and said she shared a similar experience. Despite having a master’s degree, Shuford, who is black, said she has had difficulties finding a job in the city. Haines urged the tech workers in the audience to confront their employers about a lack of diversity in their workplaces. “Ask them, ‘where are all our people of color? Where are the people who have lived in San Francisco longer than myself and why aren’t they working here?” he said.